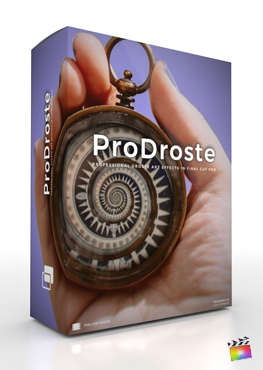 Create an artistic Droste effect in a matter of seconds with ProDroste from Pixel Film Studios. With ProDroste users can apply either the rectangular or circular effect directly onto their footage and see instant results. With easy to use on-screen controls and complete control over overall look and feel, users can create a droste effect of their own. Users have complete control over zoom, spin, strands, fractal points, and more all within Final Cut Pro X.